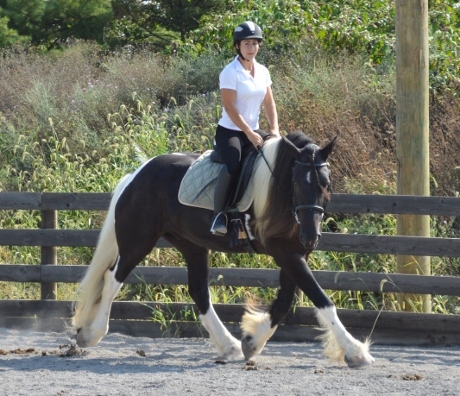 TRAINING: SOLD! 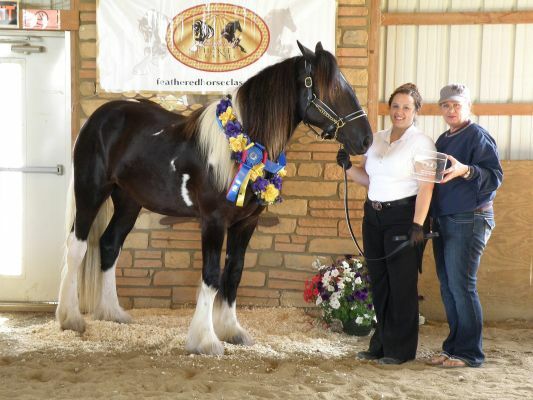 CONGRATULATIONS TO CHERYL & BRAD IN ILLINOIS! 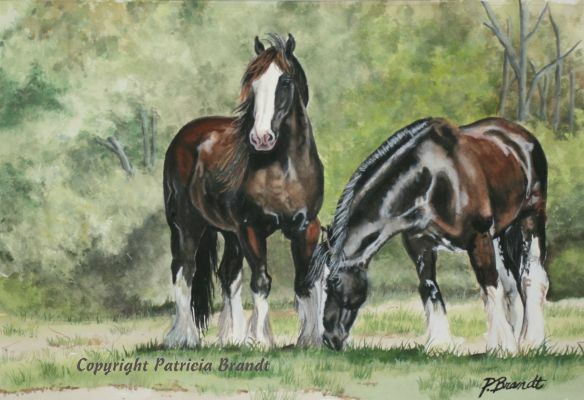 THE BEAUTIFUL 'MOON' HAS BEEN SOLD. 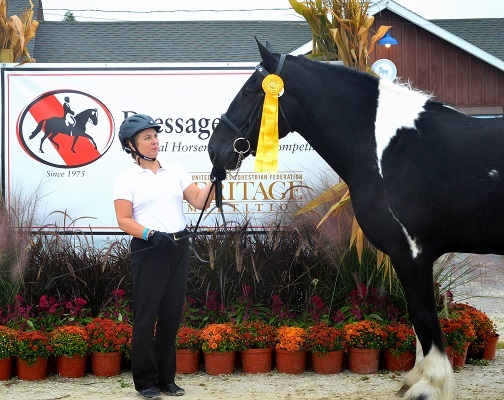 We are extremely proud to announce that "The Exhibitionist of Chestnut Oak" aka 'Moon' competed at the prestigious 2016 Dressage at Devon PA Horse Show on 9/29/16, winning 3rd Place in the IBC Drum Horse classs sponsored by International Drum Horse Association with a score of 73.125%! 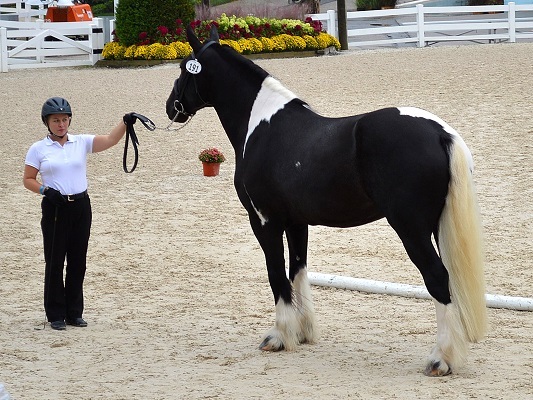 Moon was presented and shown in-hand by his owner/breeder Wendy Rager. 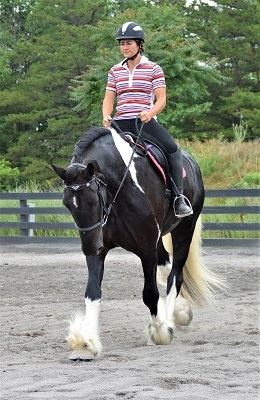 Chestnut Oak Farm's homebred Drum horse gelding "The Exhibitionist of Chestnut Oak" aka Moon, attended his 1st USDF Dressage Show on 7/9/16 winning Reserve Champion and collecting a total of 334 points! 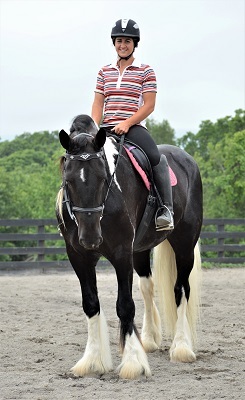 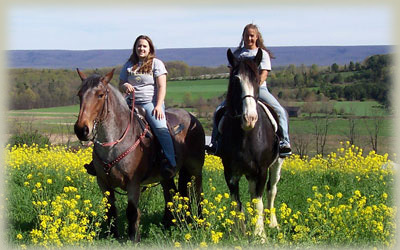 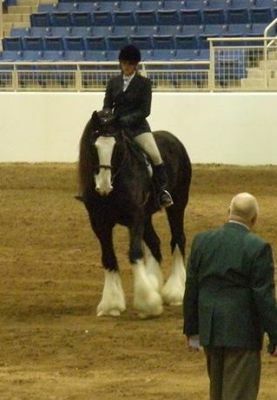 He received 1st place in USDF Introductory Level Test A, 2nd place in USDF Introductory Level Test B, and 2nd place in Introductory Level Test C. This 7 year old beauty and his rider Amy Stoltzfus scored well in Introductory Level Test A, B, & C at the Williamsport Riding Club, Williamsport PA. His 1st time under saddle in any show ring, Moon took everything in stride and we couldn't be more proud of this boy and his accomplishments! 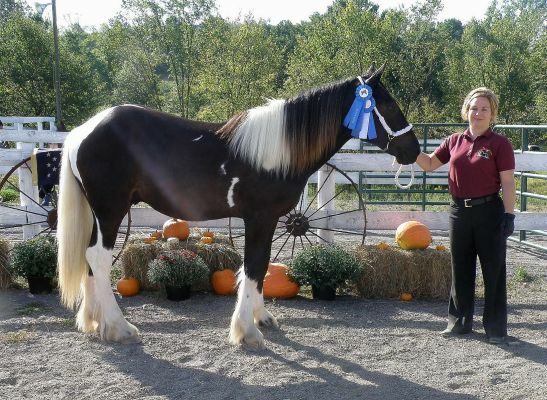 Chestnut Oak Farm proudly presents our champion homebred Drum Horse gelding of perfection and farm mascot "The Exhibitionist" aka "Moon". 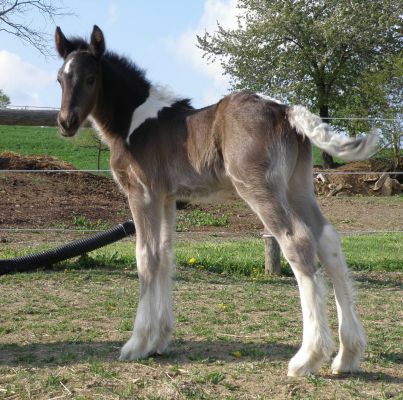 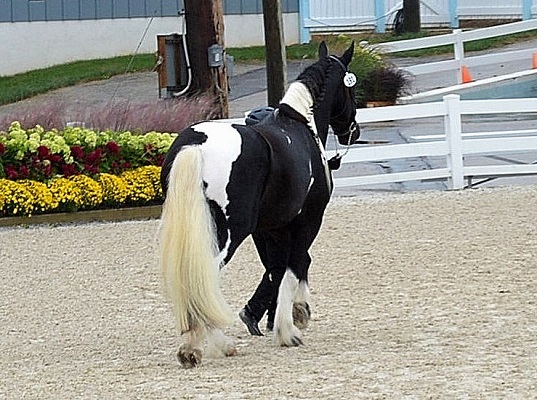 Rightfully named, this flashy boy is absolute perfection. 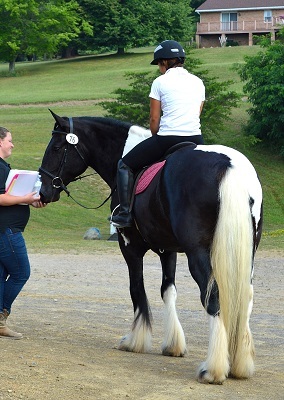 He is a crowd favorite, turning heads and attracting attention wherever he goes! 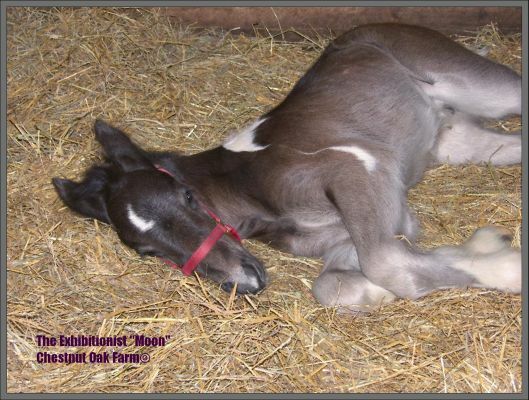 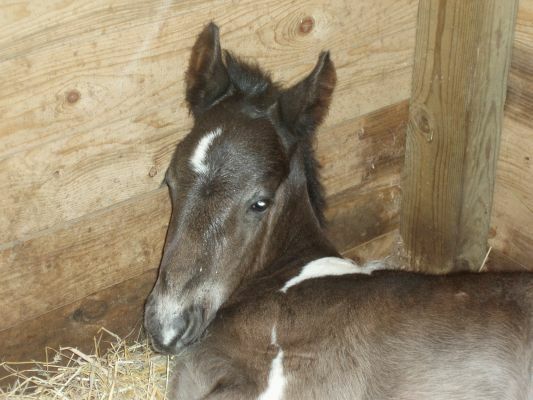 Nicknamed “Moon” as he has a white moon shaped patch on his forehead and several others on his body. 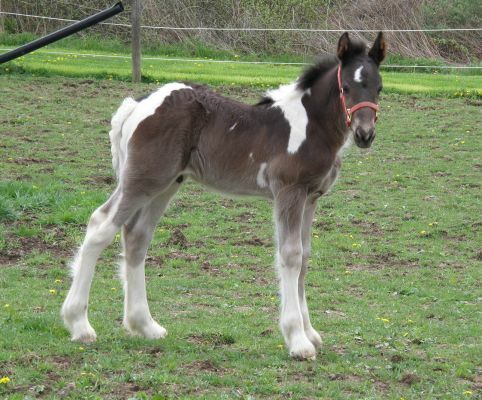 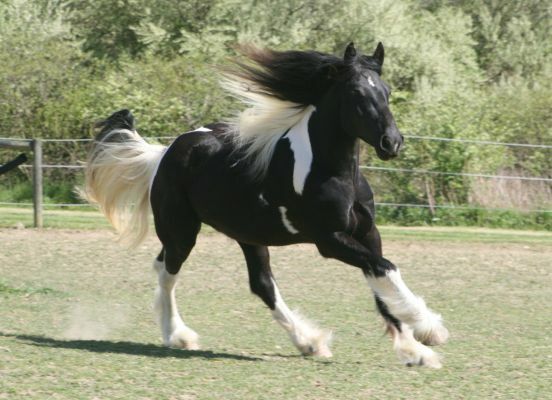 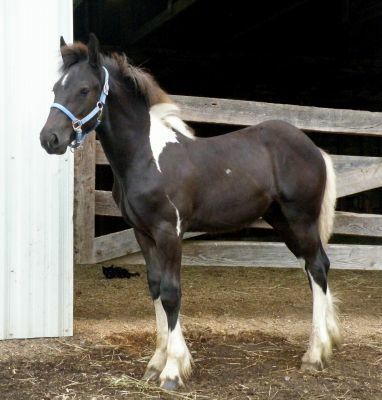 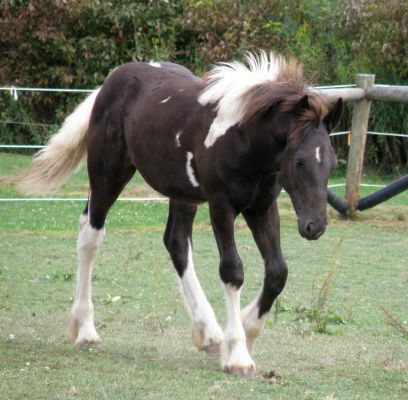 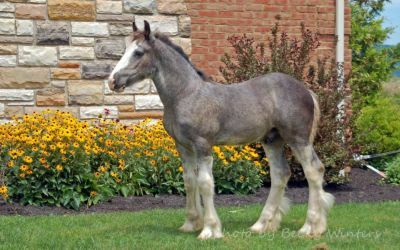 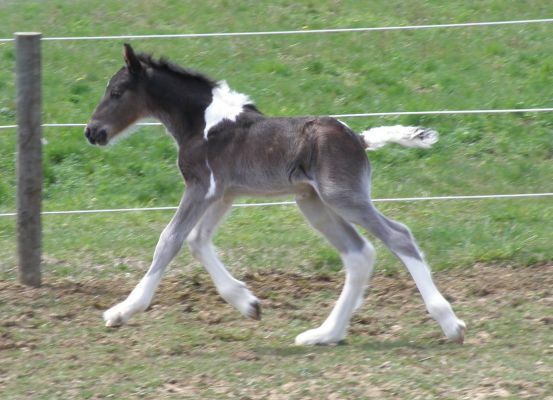 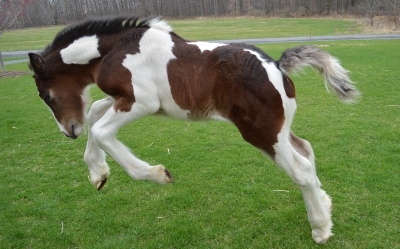 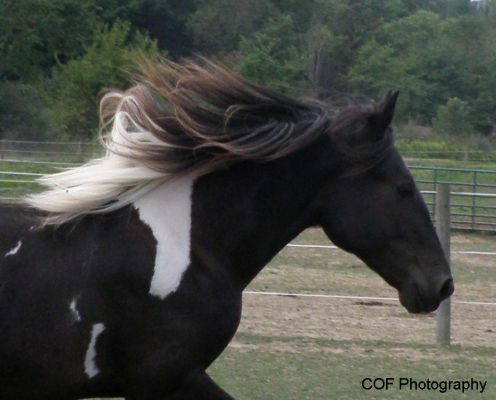 He is uniquely colored 80% black, 20% white tobiano. 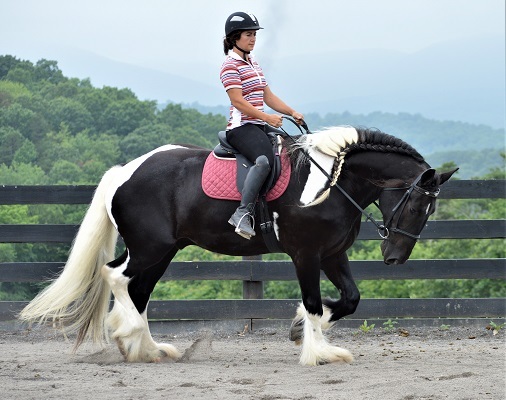 Moon has excellent conformation, an elegant modern build with good bone, superb rhythmic movement with both extension and suspension and a super smooth trot. 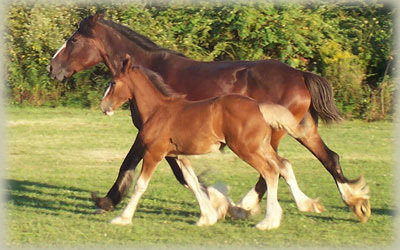 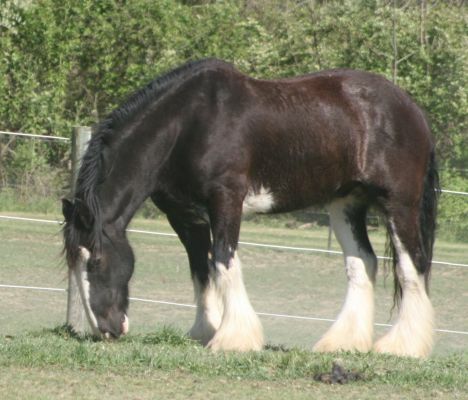 Moon stands 16.3hh, with a thick long mane and tail and nice feathering on his legs. 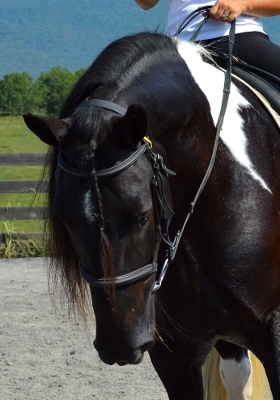 He also has one of the most beautiful heads we've seen on any horse! 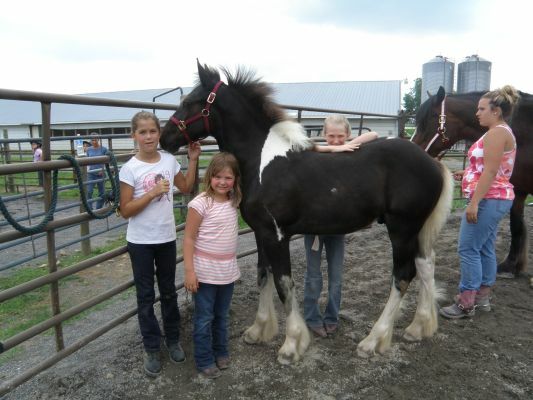 Moon is the friendliest horse we have ever met. 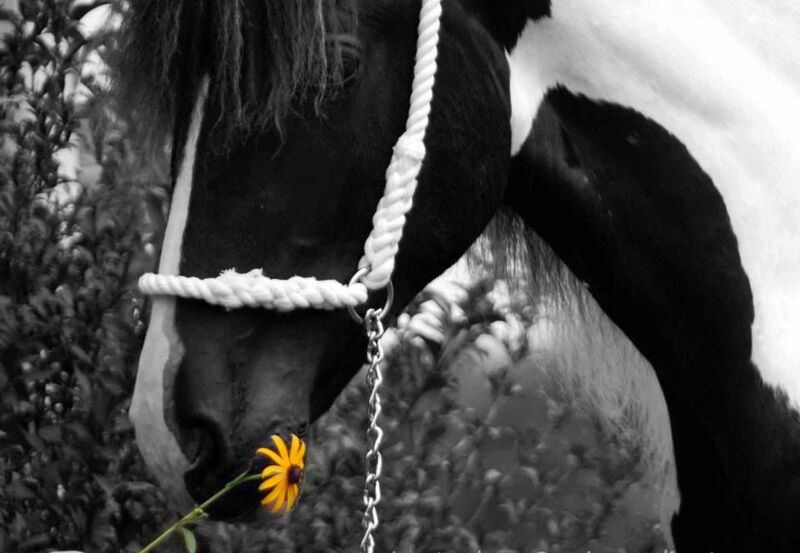 He will leave his buddies and food behind just to be with his human companions. 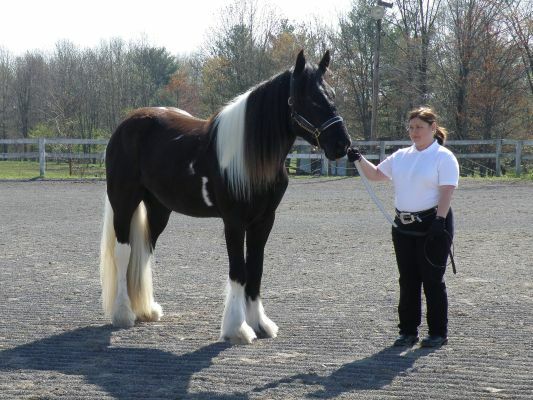 He has amazing patience and will stand for hours to be brushed and spend time with people. 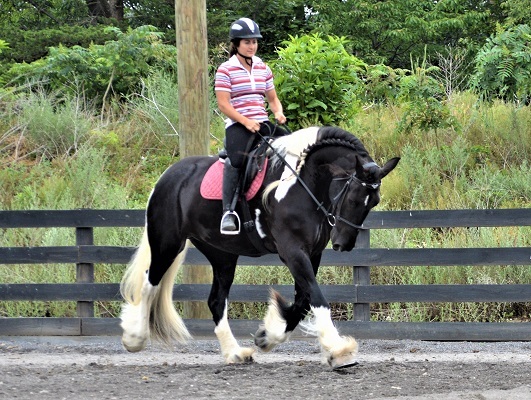 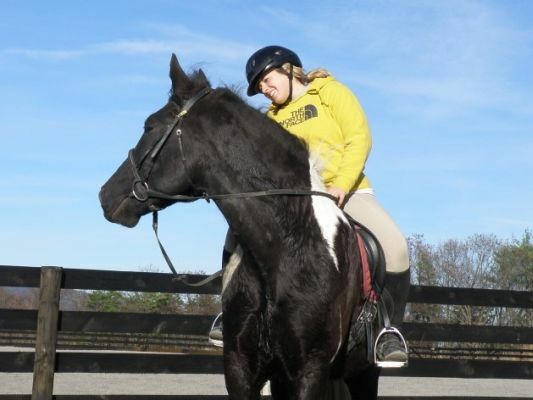 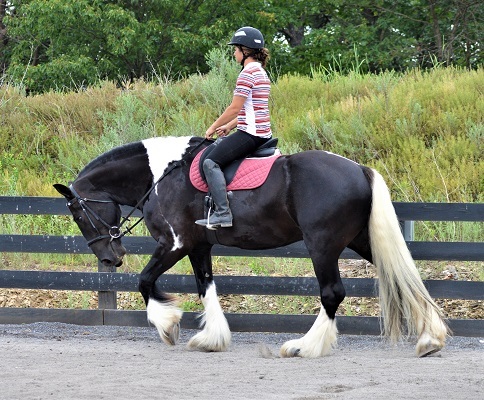 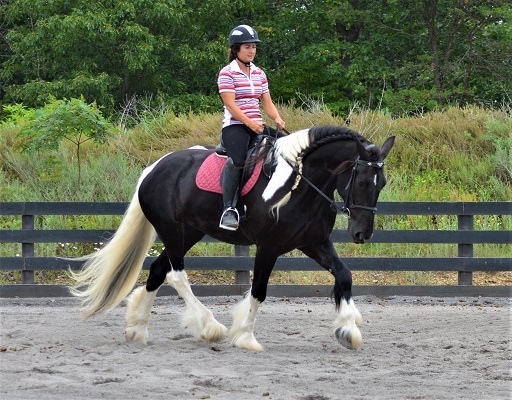 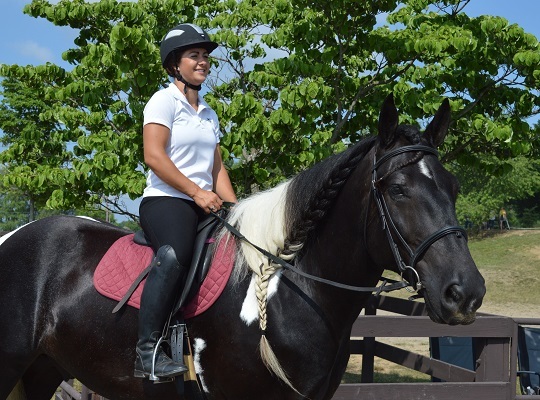 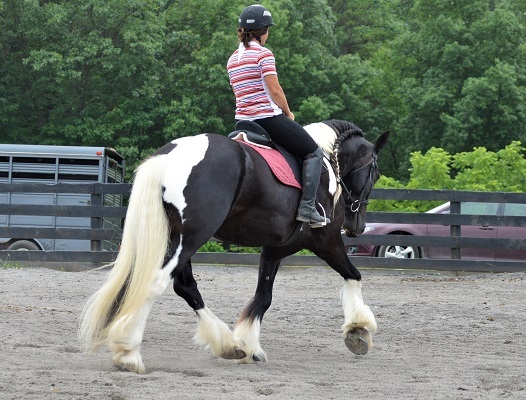 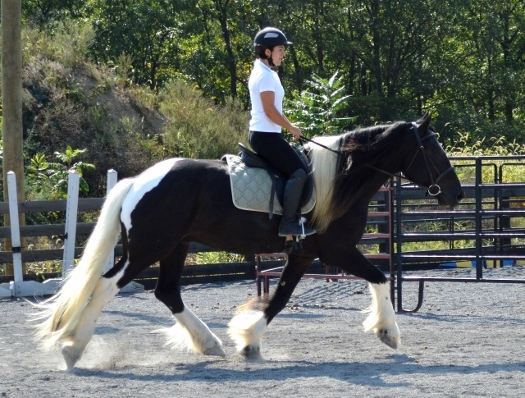 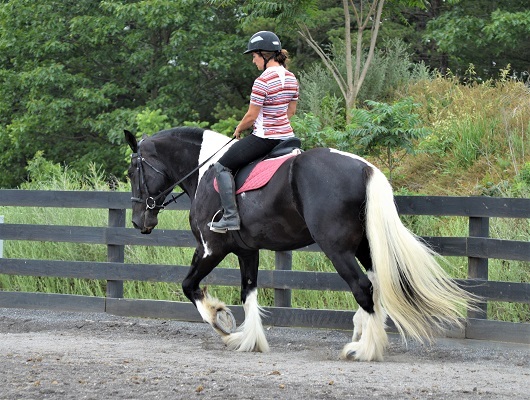 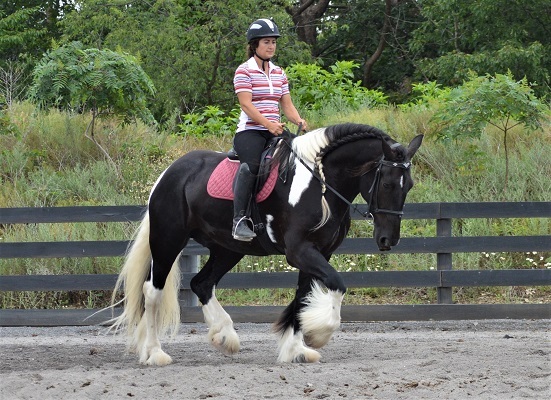 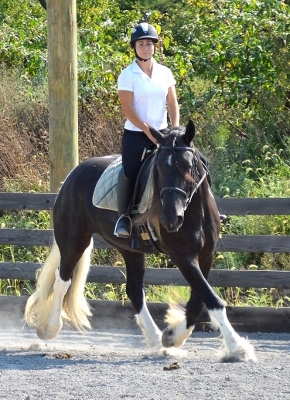 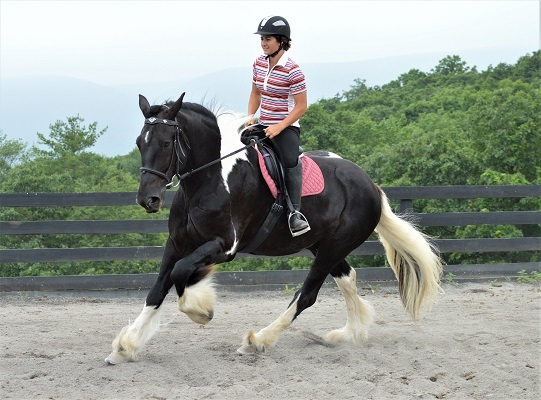 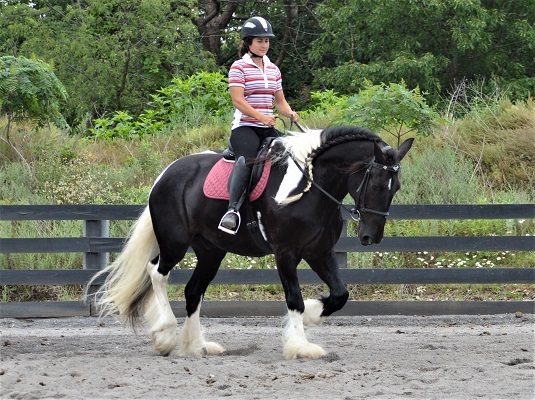 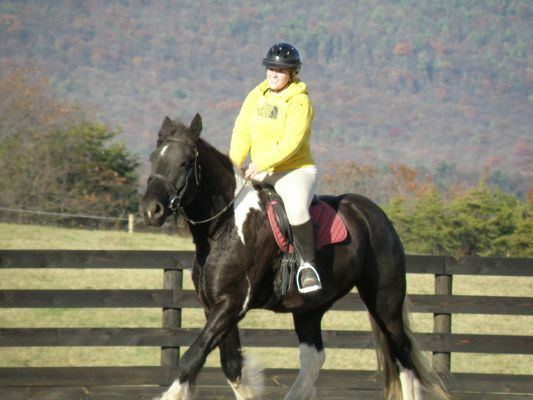 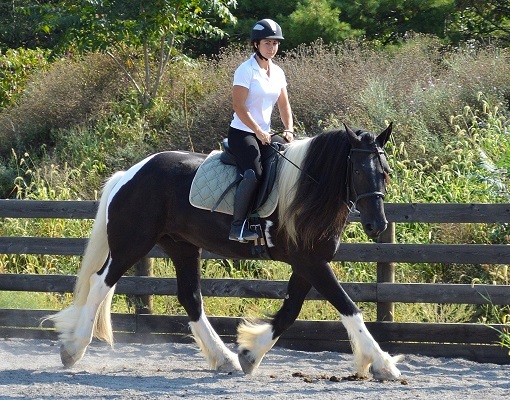 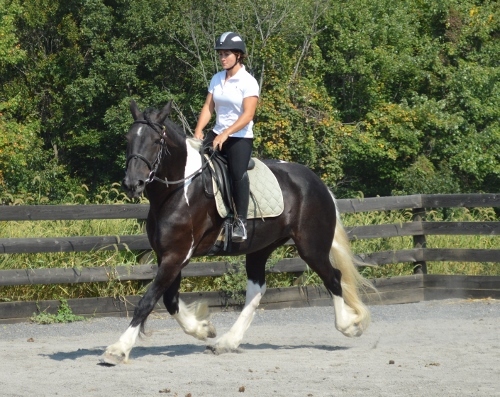 He is trained in Halter, English Pleasure, Hunter/Jumper, Dressage, and Ground Driving and has had four months of professional Dressage training. 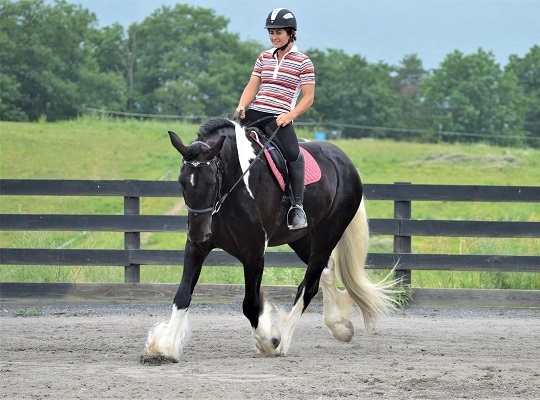 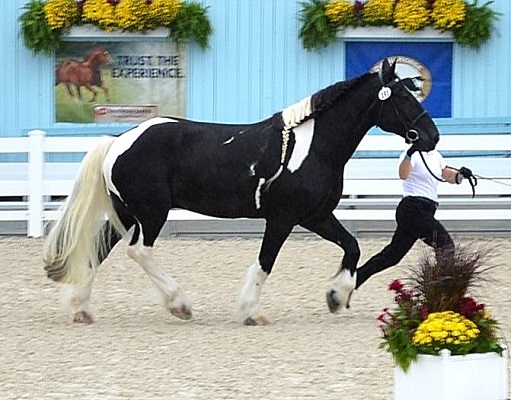 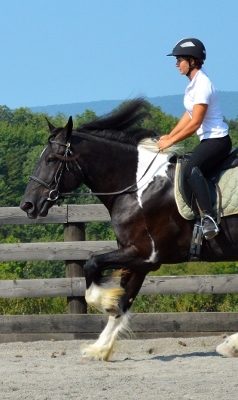 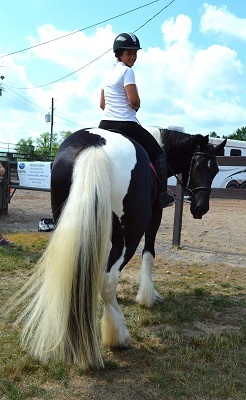 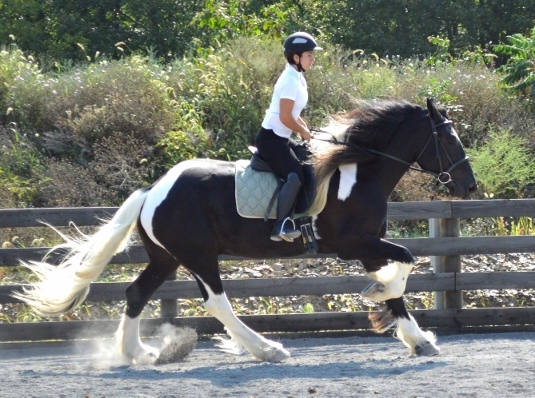 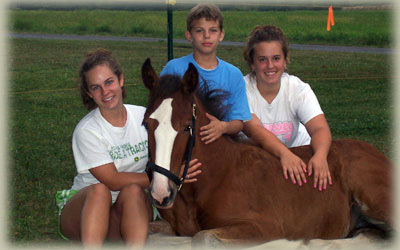 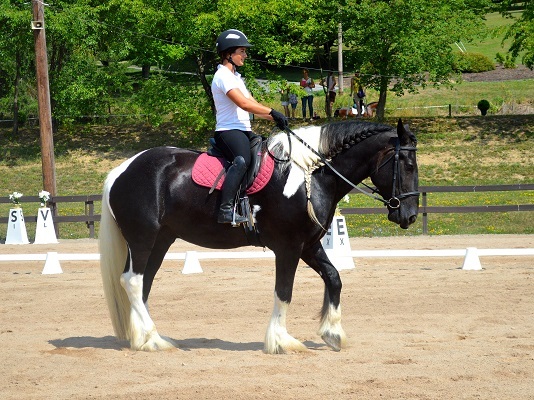 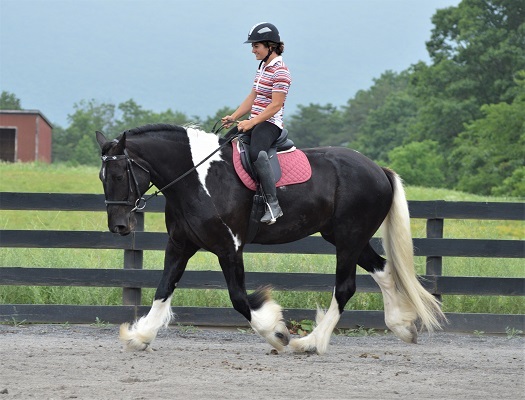 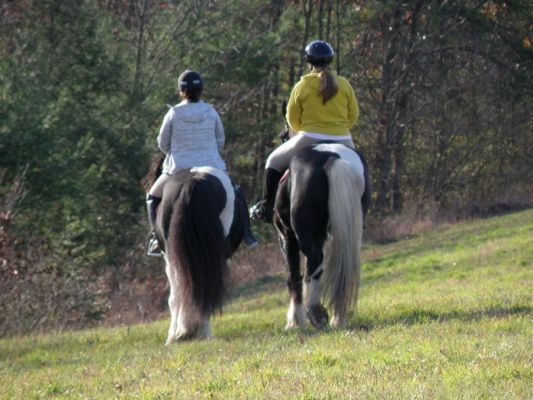 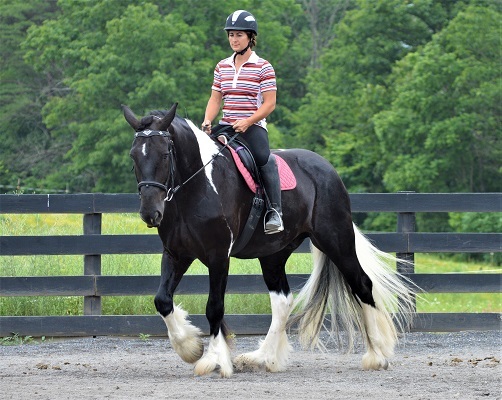 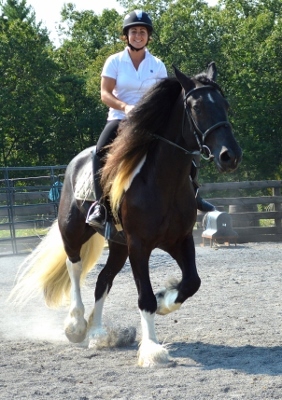 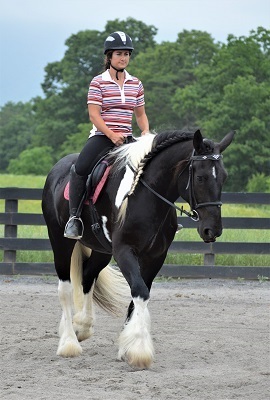 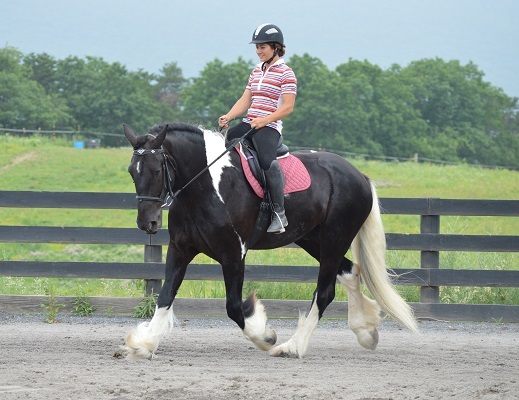 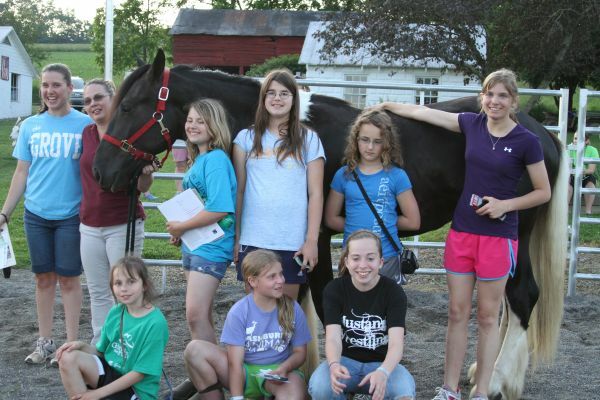 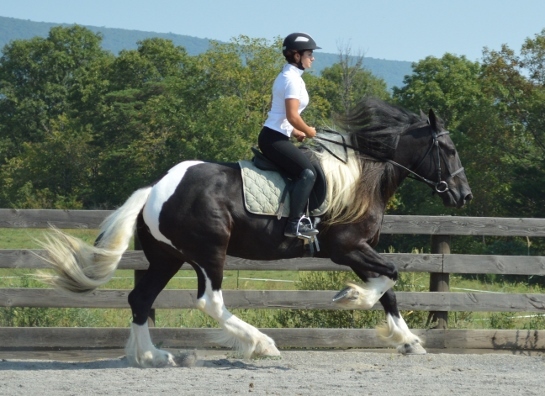 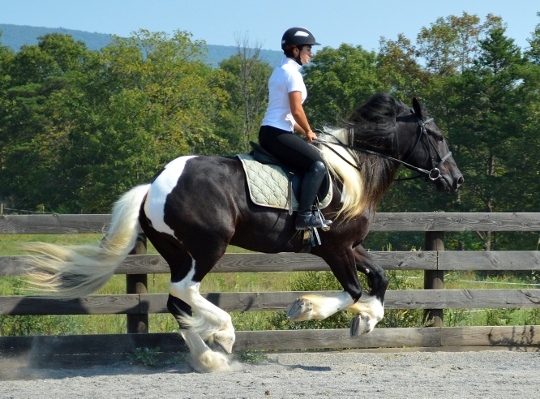 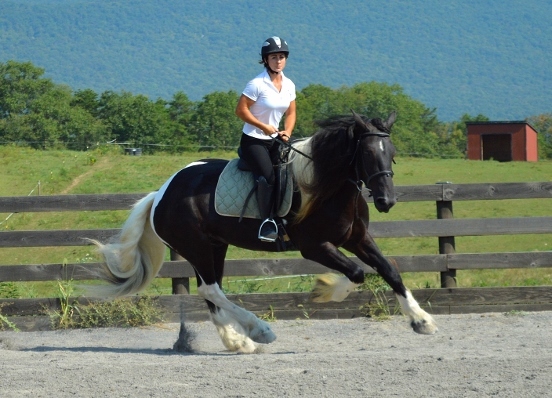 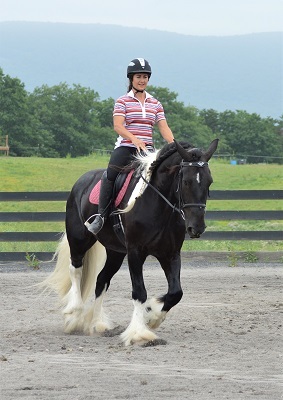 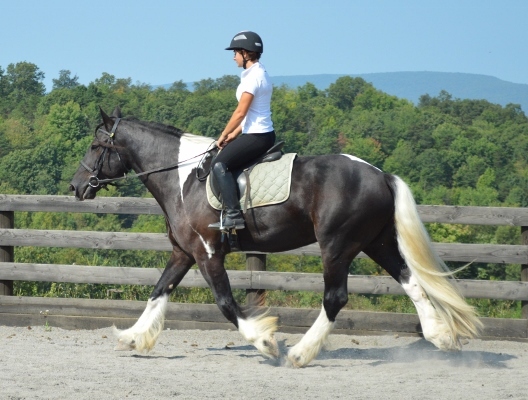 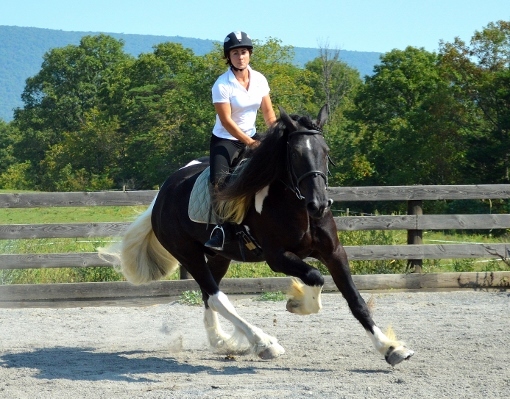 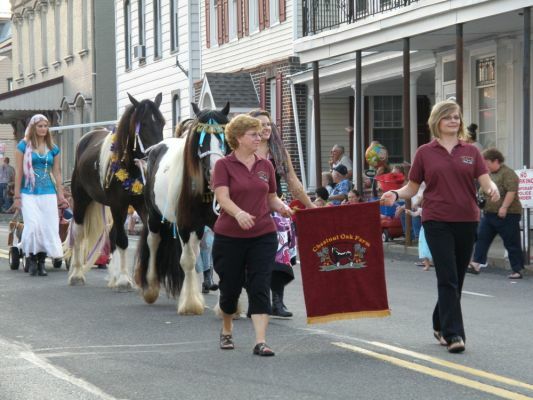 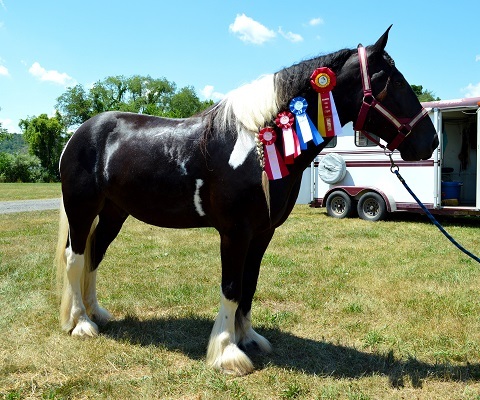 Moon has attended many open and breed shows; local, regional, and international, including the Feathered Horse Classic in PA, Dressage at Devon PA, USDF Dressage Shows, local fairs, parades, and horse camps. 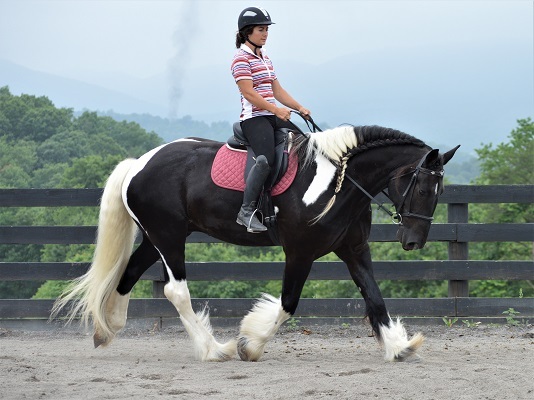 We will continue with his training in the discipline of dressage and of course, he will continue to enlighten the hearts of others. 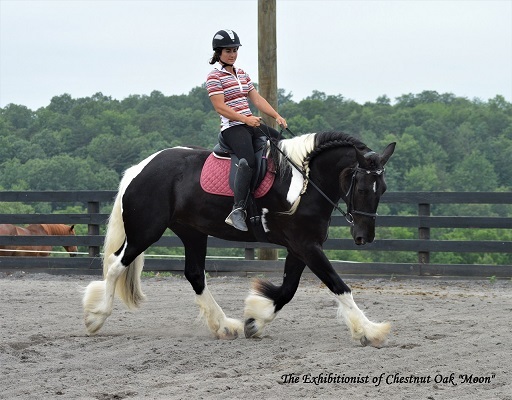 RIP CAPTAIN...GONE...BUT NEVER FORGOTTEN...Chestnut Oak Farm proudly announces the newest addition to the farm, a gorgeous team of English Imported Black Shire Geldings, Ruskington Charlie (Captain) and Deighton Panther (Jaguar). 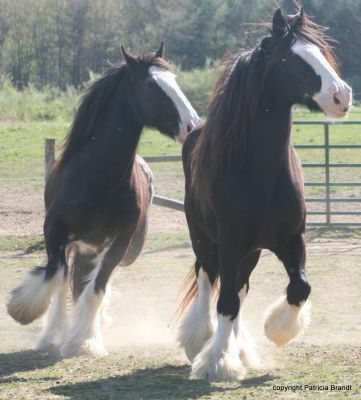 These two large majestic boys are making quite a statement here at the farm and we have "big" plans for them. 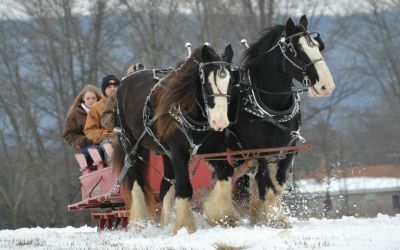 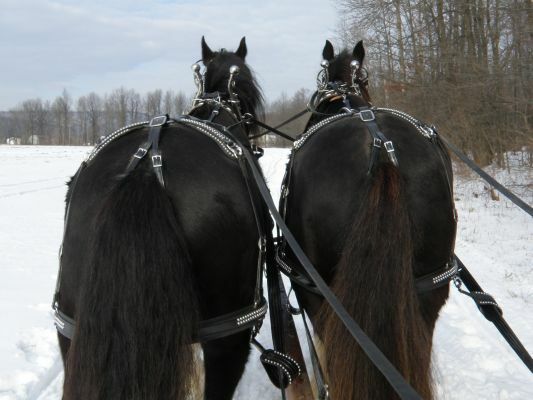 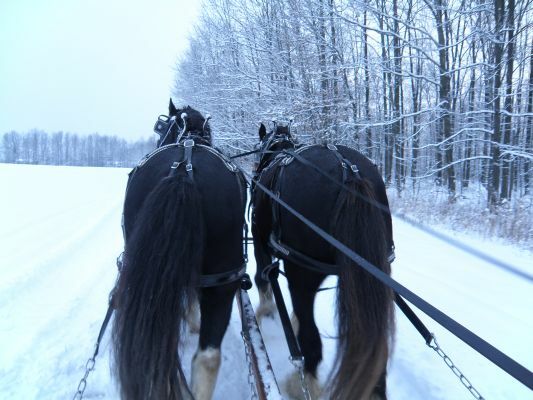 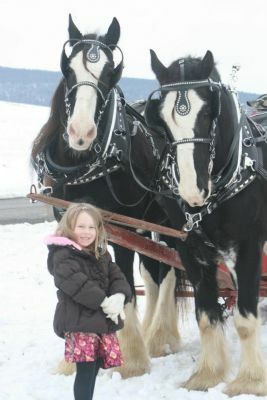 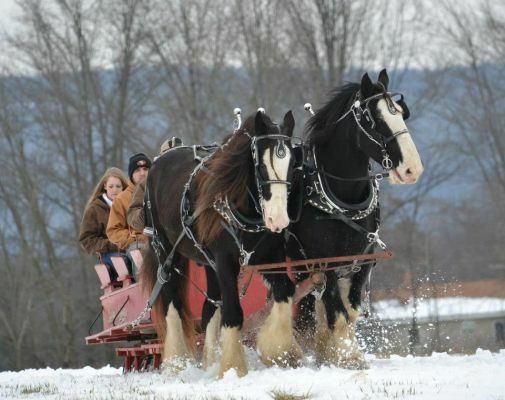 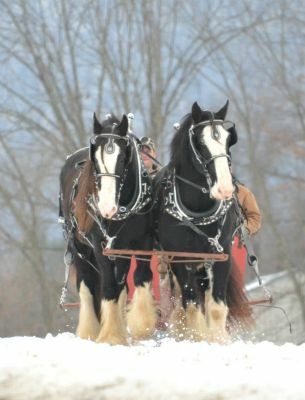 Giving sleigh and wagon rides are top on the priority list, but that may just be the beginning. 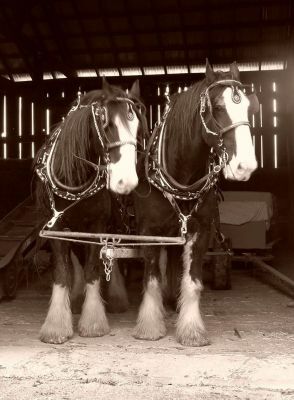 Keep checking back to see what these two fabulous boys have accomplished! 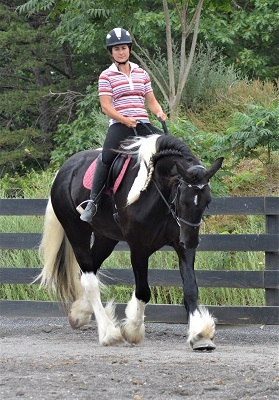 One of the sweetest horses on the farm, Captain commands attention with his majestic old style charm and stunning good looks. 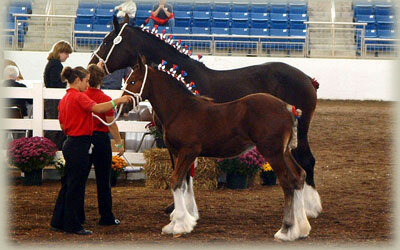 Imported from England as a two year old, he is by Landcliffe Aristocrat and out of Foxoaks Legacy. 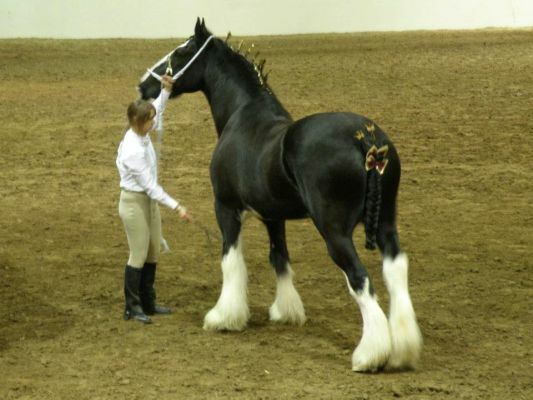 A beautiful neck and shoulder, great top line, heavy bone, and super thick feather are some of his best qualities. 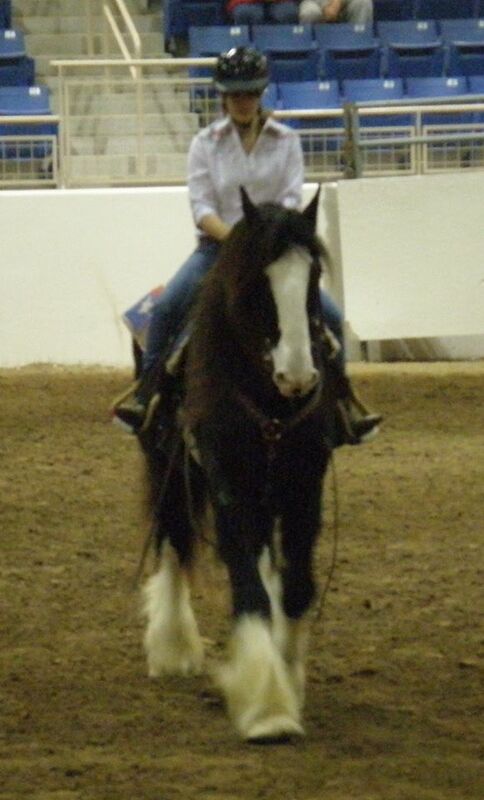 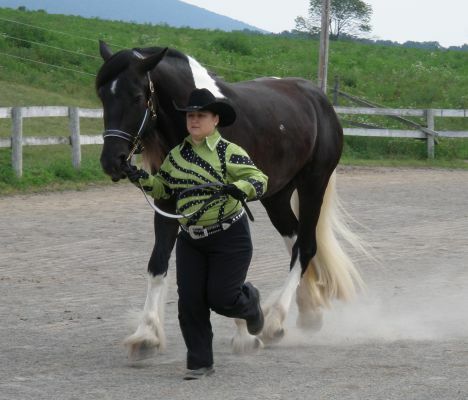 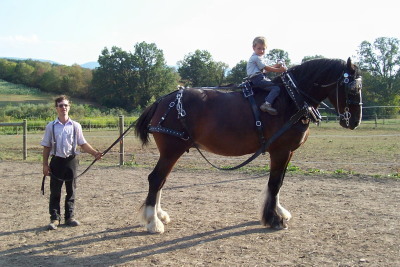 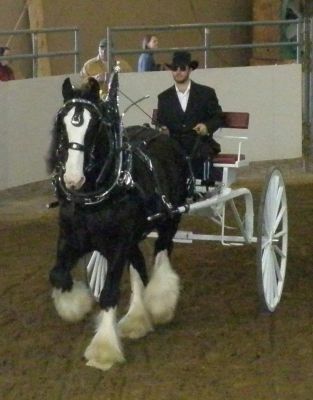 He moves with much knee and hock action and is a great example of a hitch horse. 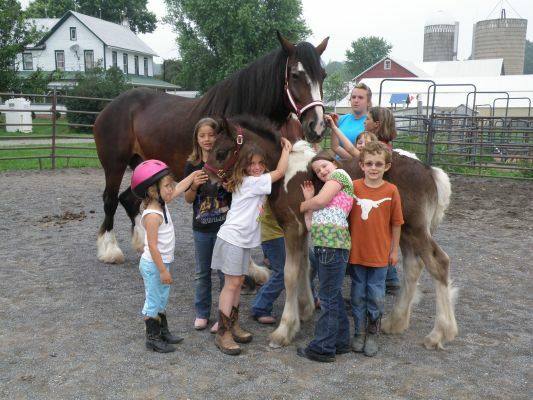 A wonderful ambassador for the Shire breed, Captain has a special love of children and enjoys being surrounded by kids, making his favorite job babysitting! 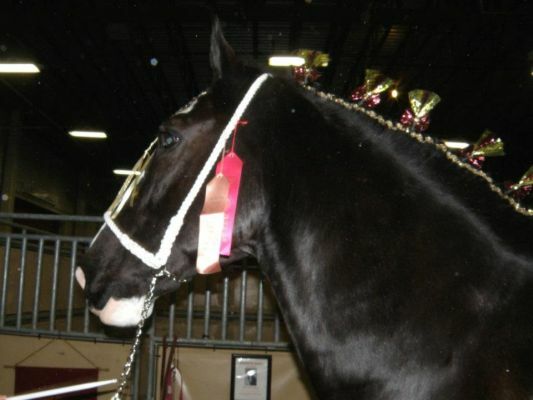 Captain and his teammate Jaguar made 2012 PA Farm Show history when they won 2nd place in Mated Team Halter, as this was only the second year that shires competed, the first was our own shire mare Steege's Zena, who won 1st place in Clydesdale/Shire Halter mare class! 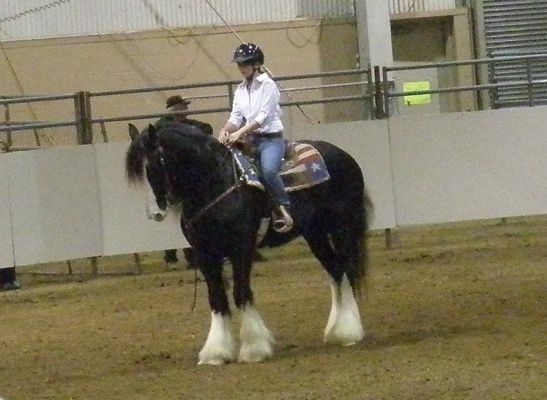 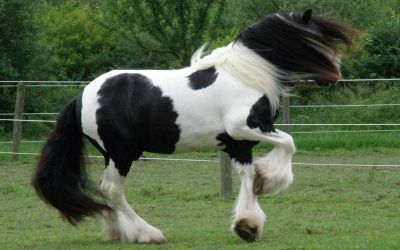 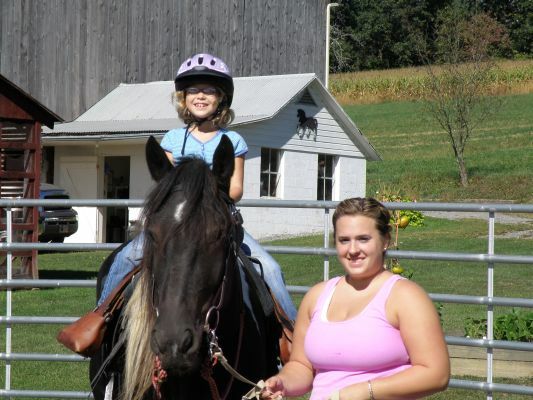 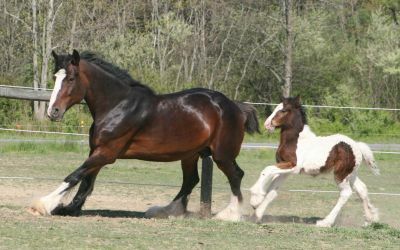 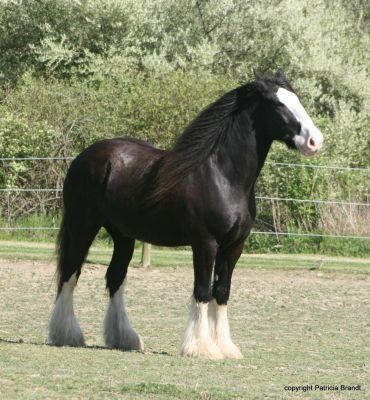 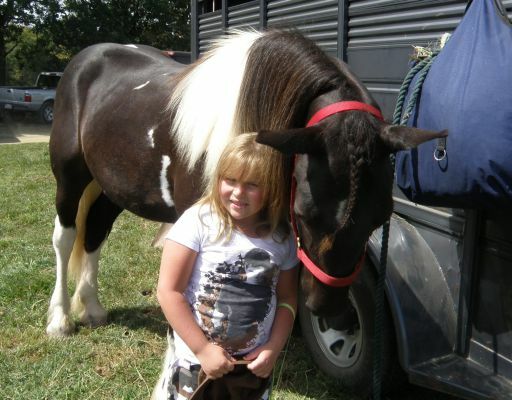 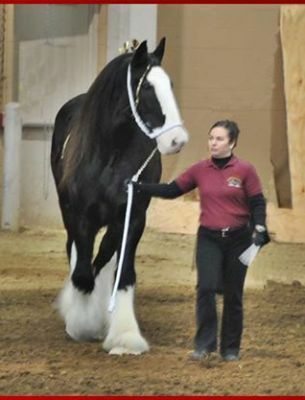 We will enjoy showing and promoting Captain as the wonderful shire horse he is! 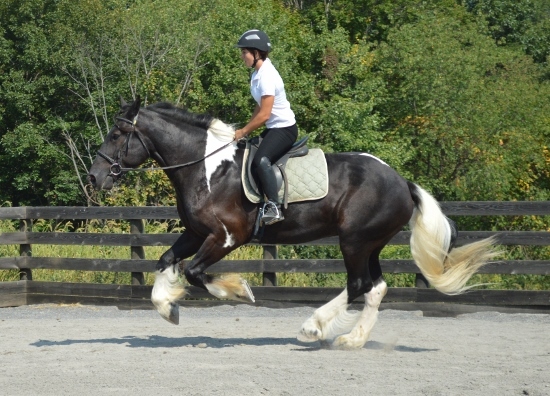 TRAINING: SOLD! 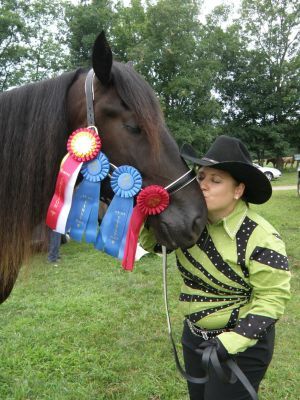 CONGRATULATIONS TO PARIS & GARY IN RHODE ISLAND! 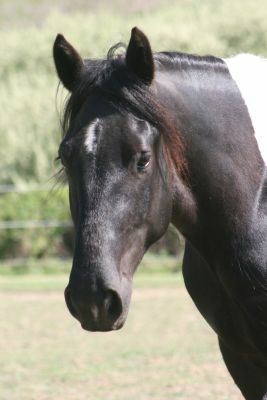 THE BEAUTIFUL JAGUAR HAS BEEN SOLD. 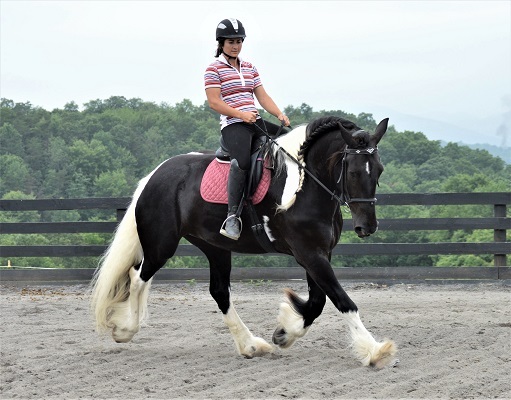 Chestnut Oak Farm proudly announces the newest addition to the farm, a gorgeous team of English Imported Black Shire Geldings, Deighton Panther (Jaguar) and Ruskington Charlie (Captain). 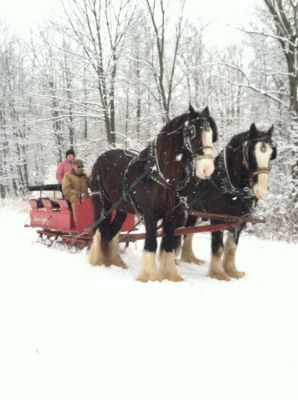 These two large majestic boys are making quite a statement here at the farm and we have "big" plans for them. 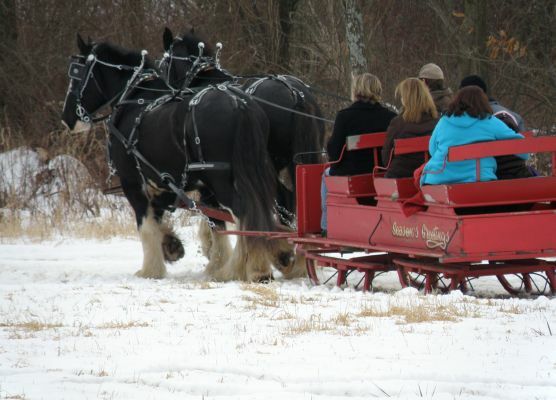 Giving sleigh and wagon rides are top on the priority list, but that may just be the beginning. 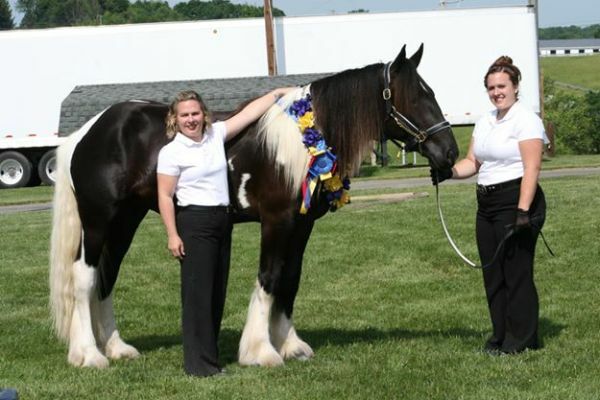 Keep checking back to see what these two fabulous boys have accomplished! 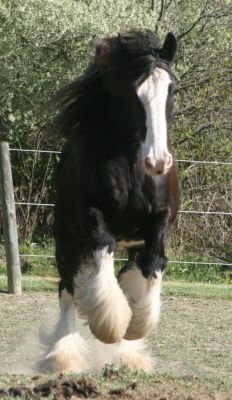 Jaguar has a sweet, comical personality and enjoys entertaining guests with his playful demeanor. 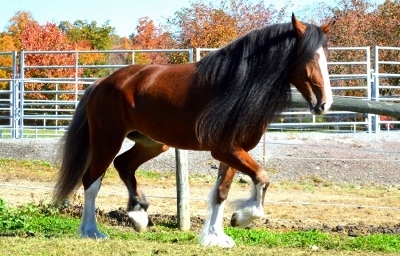 His large amounts of hair and feather coupled with his showy attitude give him a beautiful fantasy look. 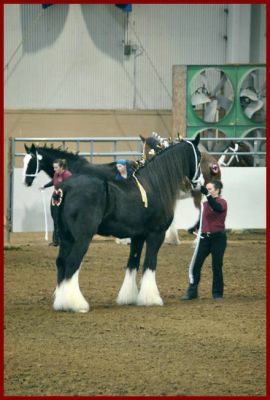 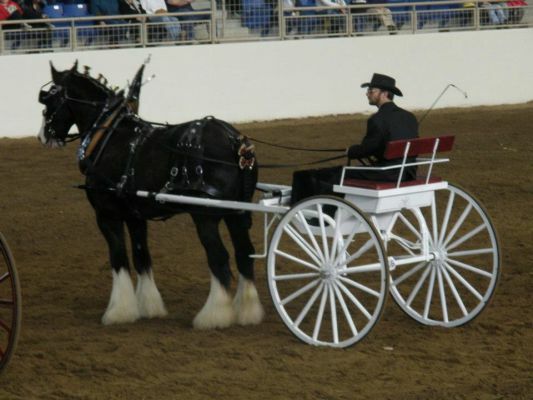 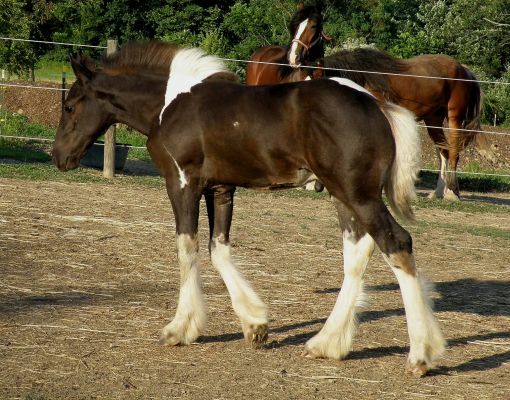 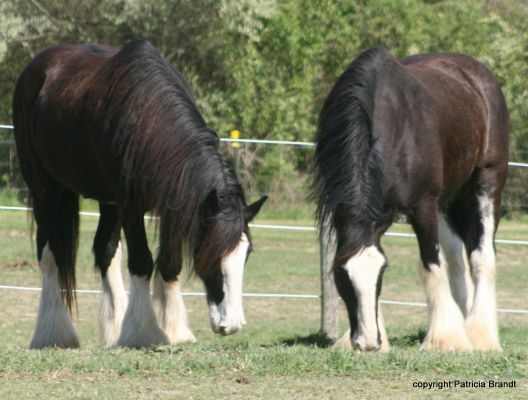 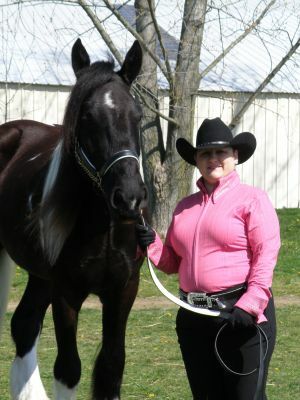 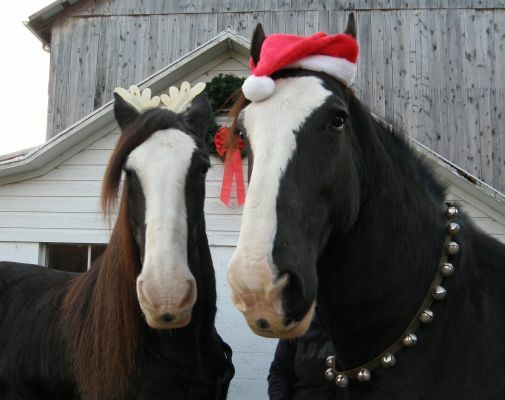 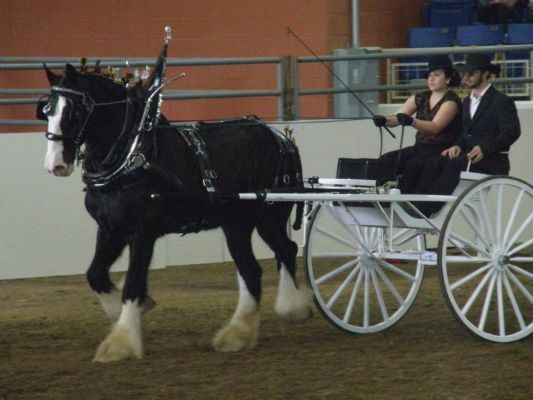 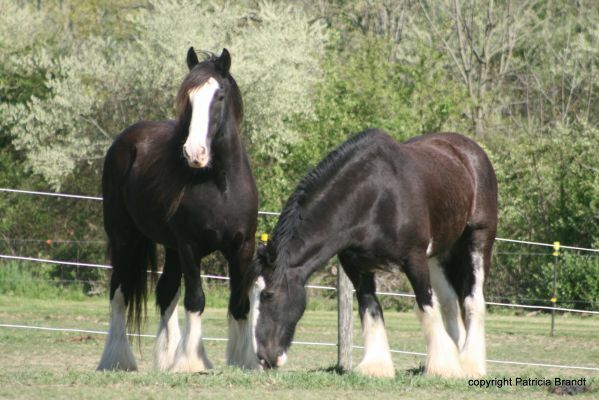 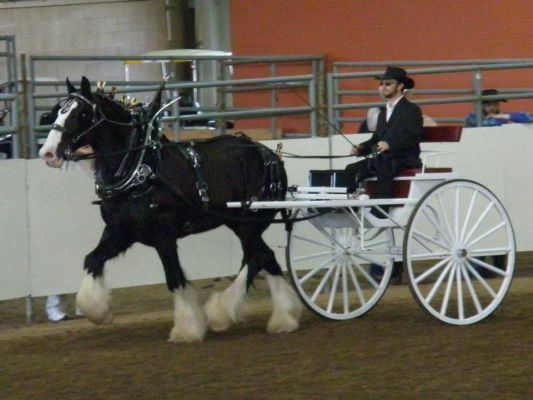 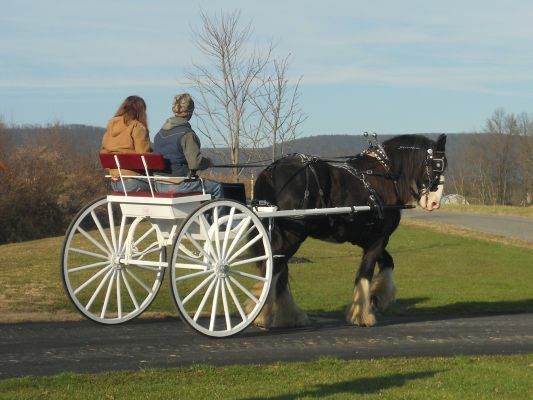 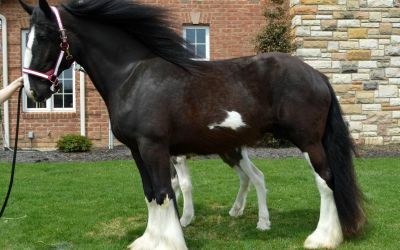 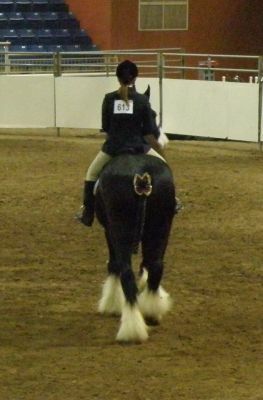 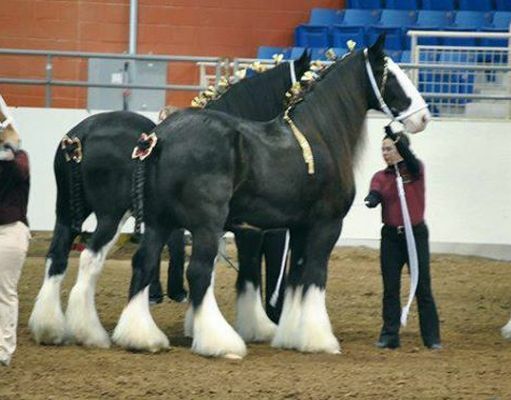 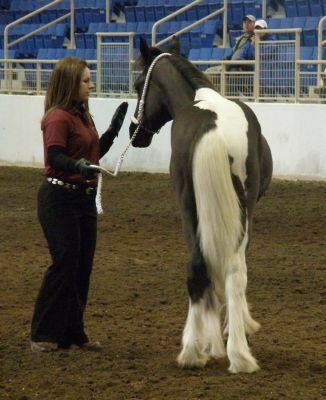 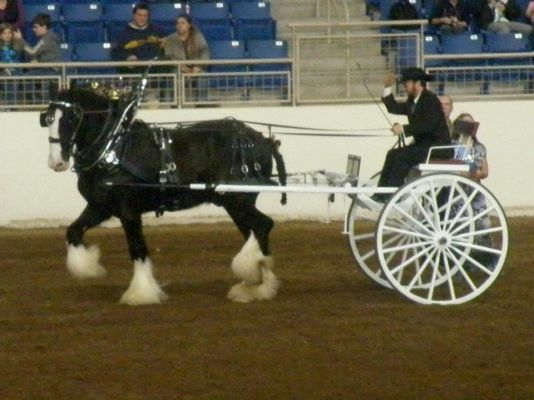 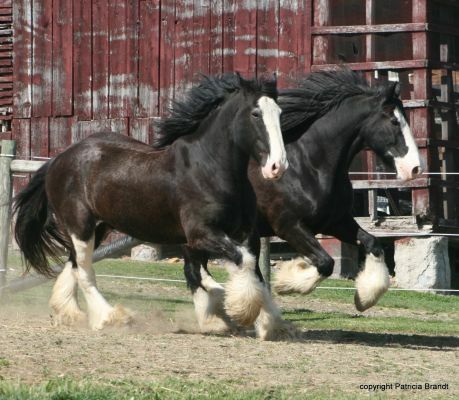 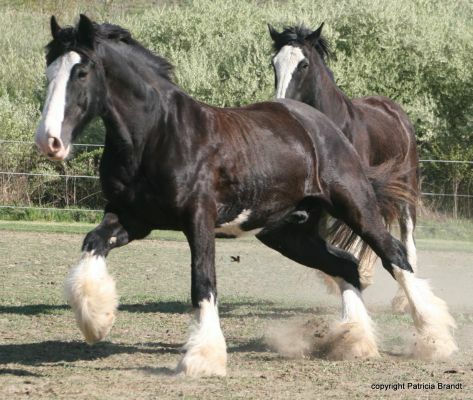 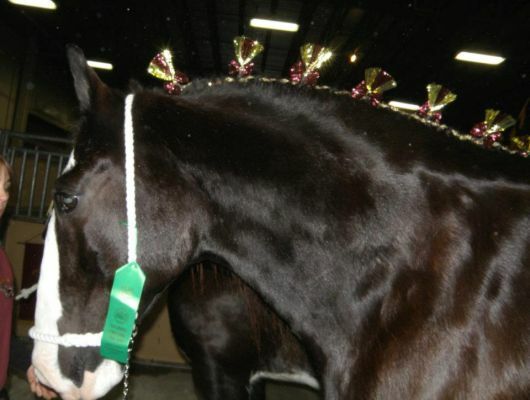 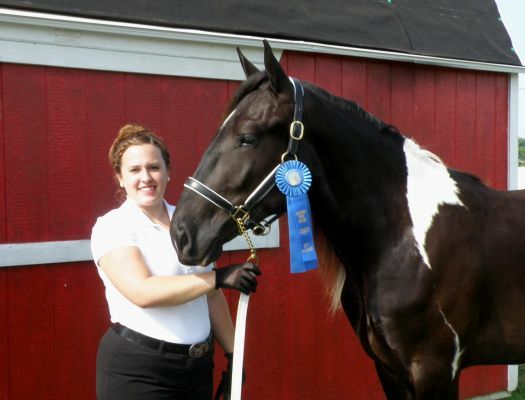 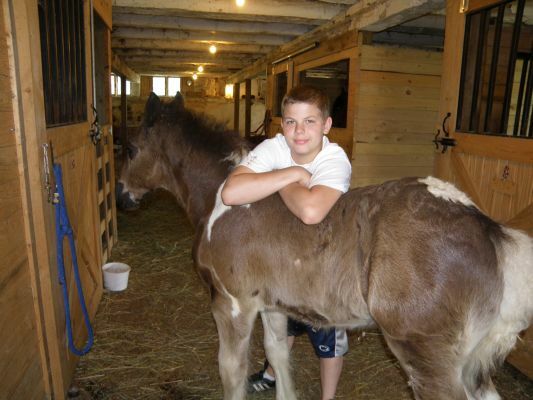 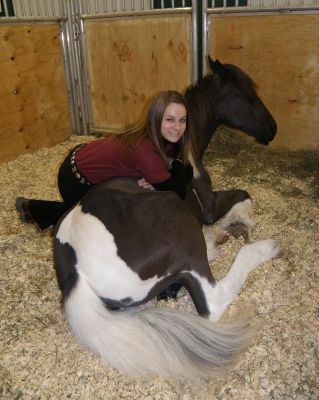 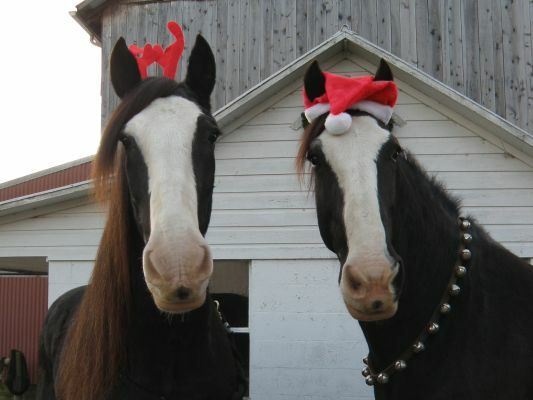 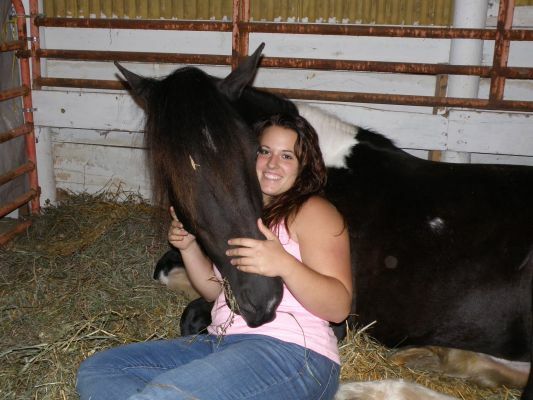 He and his teammate Captain made 2012 PA Farm Show history when they won 2nd place in Mated Team Halter, as this was only the second year that shires competed, the first was our own shire mare Steege's Zena, who won 1st place in Clydesdale/Shire Halter mare class! 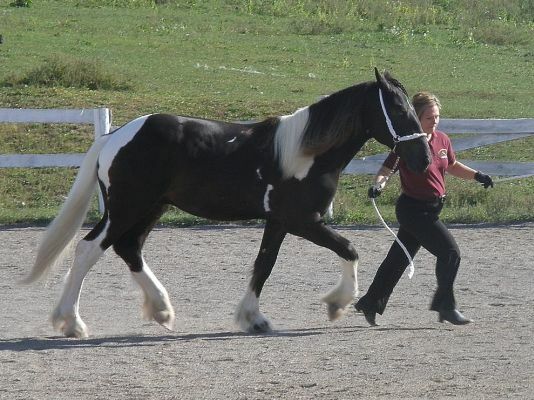 We will enjoy showing and promoting Jaguar as the wonderful shire horse he is! 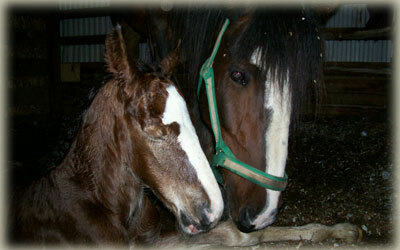 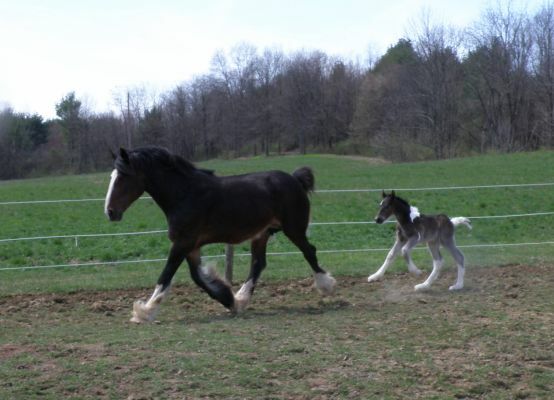 Copyright © Chestnut Oak Farm.